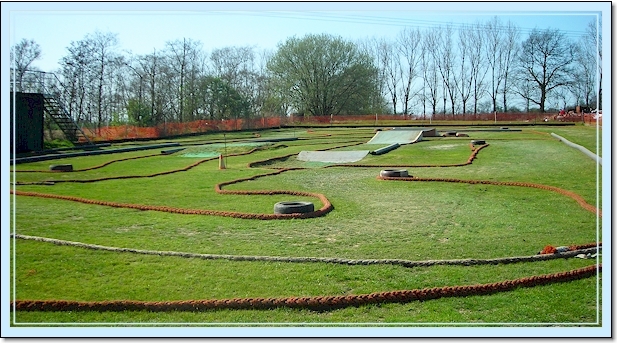 Mid Essex Radio Car Club’s permanent ‘off-road’ facility is situated in a large grass field at Broadfield Fruit Farm near Great Braxted, off the A12 east of Witham, Essex. There is ample room for car parking and camping, male/female toilets and mains water being permanently on-site. Before 2011 the track area was approximately 150 feet long and 75 feet wide, but was increased by 38% last year. This has given more scope and flexibility with track design. The track is level ground and predominantly grass, except for ‘fixed’ features (Table-Top, Camel-Humps & Bomb-Hole) which have Astroturf surfaces. There is also a concrete jump ramp, a portable ‘cross-over bridge’ and all features allow for track designs to enable cars to run in either direction. A large race control caravan, centrally positioned allows a good view of the track and the Timing Loop is permanently installed. The track area has its own purpose built drivers rostrum which faces north, so bright sun does not present a problem to drivers. Thick ropes are used for track marking, which also permits variation in track designs – both clockwise and anti-clockwise running.